Each week during the season we update the Top 25 rankings in Class 1A providing our Top 10 teams as well as provide The Next 15 teams that we have ranked to complete the Top 25 rankings. Information used to determine the rankings include record, quality wins, defeating ranked opponents and strength of schedule (after Week 1). 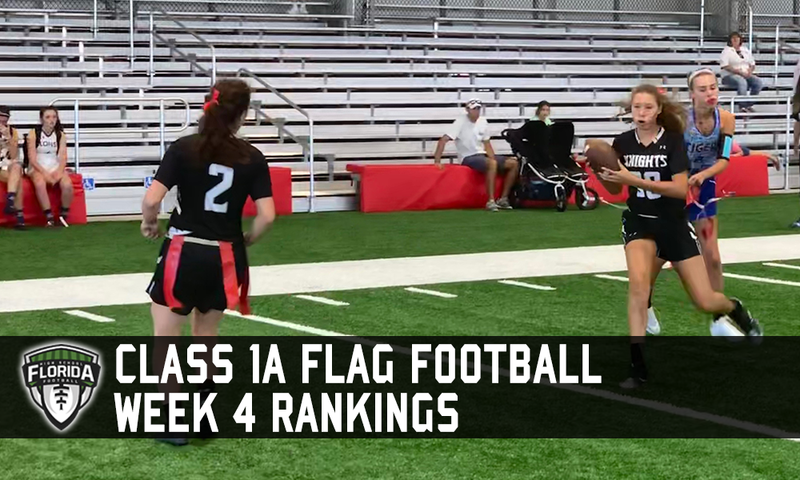 It is important that teams update their information with scores with us on a regular basis each week by emailing us score reports at flag@floridahsfootball.com, sending us a direct message on Twitter @FlaHSFootball or updating scores in the ScoreStream app. Lack of information (scores) reported by the teams will only hurt their chances of being ranked, especially if they are having a solid season. NOTE: The Knights return to action this week with games against rival Plant and Hillsborough on the schedule. NOTE: The Cougars will return to action this week with a district game against Chiles before heading up to New York this week for the first interstate games between Florida and New York with Tottenville and New Dorp. NOTE: The Blue Devils get back on the field this week with district games against Westside and Ed White on the schedule. NOTE: The Red Raiders took care of business against Hialeah-Miami Lakes to go into spring break undefeated. NOTE: The Raiders get back to work this week with three games with district games against Sebring and Okeechobee plus a home contest with No. 6 Monsignor Pace. NOTE: The Spartans took care of business last week, throttling Miami Norland in a key district contest. However, unlike the rest of the Miami-Dade teams being on spring break this week, Monsignor Pace is not and will travel to Palm Beach County later this week for a matchup against No. 6 Monsignor Pace. NOTE: This is a big week for the Trojans coming off of spring break as they will first face a good FAMU DRS team followed up by playing No. 13 Niceville and No. 19 Choctawhatchee at the end of the week. NOTE: With spring break over, the Sandcrabs return to action this week with district contests against Matanzas and Atlantic (Port Orange) awaiting on the docket. NOTE: Florida High can potentially clinch a spot in the District 1A-2 tournament this week if they get wins over Rickards and Wakulla in their games scheduled for this week as they come off of spring break. NOTE: Jensen Beach’s games last week against Lake Placid and Sebring were rescheduled with Sebring rescheduled for Monday, March 25 with the Lake Placid game pending. The Falcons also have games with Port St. Lucie and Fort Pierce Westwood on the schedule this week as well.